Regulation (EC) No 661/2009 repeals Council Directive 70/387/EEC of 27 July 1970 on the approximation of the laws of the Member States relating to the doors of motor vehicles and their trailers (3) as well as Council Directive 75/443/EEC of 26 June 1975 on the approximation of the laws of the Member States relating to the reverse and speedometer equipment of motor vehicles (4). The requirements set out in those Directives for access steps, handholds and running boards as well as reversing devices should be carried over to this Regulation and, where necessary, adapted to the development of scientific and technical knowledge. Certain other requirements laid down in those Directives and which are not covered by this Regulation are already addressed through the compulsory application of UNECE Regulation No 11 (5) and Regulation No 39 (6) listed in Annex IV to Regulation (EC) No 661/2009. The scope of this Regulation should be in line with that of Directive 70/387/EEC and Directive 75/443/EEC insofar appropriate. The Regulation should therefore cover vehicles of categories M and N.
Regulation (EC) No 661/2009 lays down basic requirements for the type-approval of motor vehicles with regard to vehicle access, namely access steps, handholds and running boards as well as manoeuvrability, namely reversing devices. It is necessary to set out the specific procedures, tests and requirements for such type-approval. This Regulation applies to vehicles of categories M and N as defined in Annex II to Directive 2007/46/EC. the characteristics of the reversing device. 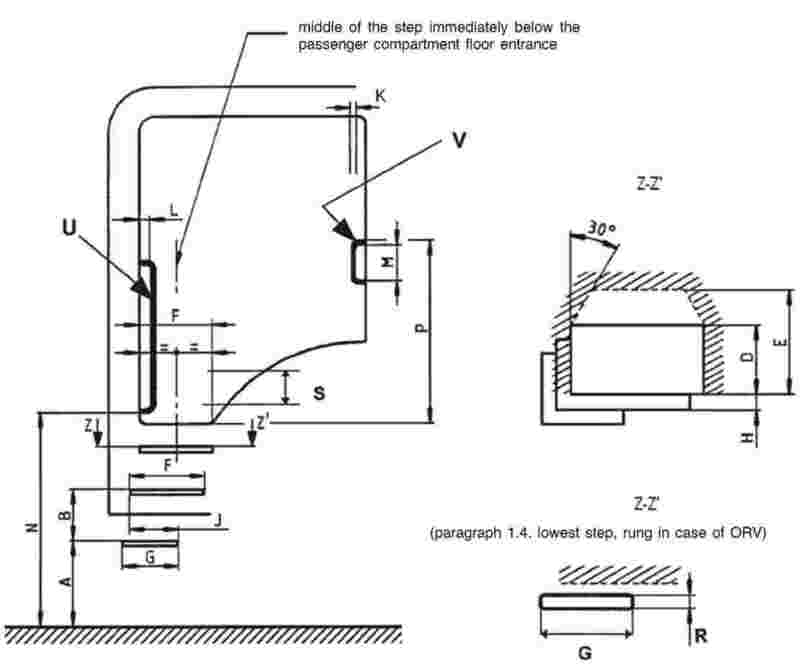 ‘floor entrance’ means the lowest point of the door aperture or other structure whichever of the two is higher, which a person has to clear in terms of height in order to enter the passenger compartment. 1. The manufacturer or the representative of the manufacturer shall submit to the approval authority the application for EC type-approval of a vehicle with regard to vehicle access and manoeuvrability. 3. If the relevant requirements set out in Annexes II and III to this Regulation are met, the approval authority shall grant an EC type-approval and issue a type-approval number in accordance with the numbering system set out in Annex VII to Directive 2007/46/EC. National authorities shall permit the sale and entry into service of vehicles type-approved before the date referred to in Article 13(2) of Regulation (EC) No 661/2009 and continue to grant extension of approvals to those vehicles under the terms of Directive 70/387/EEC and Directive 75/443/EEC. Done at Brussels, 15 February 2012. (1) OJ L 200, 31.07.2009, p. 1. (3) OJ L 176, 10.8.1970, p. 5. (4) OJ L 196, 26.7.1975, p. 1. (5) OJ L 120, 13.5.2010, p. 1. (6) OJ L 120, 13.5.2010, p. 40. Information document No … relating to the EC type-approval of a vehicle with regard to vehicle access and manoeuvrability. (5) The mass of the driver and, if applicable, of the crew member is assessed at 75 kg (subdivided into 68 kg occupant mass and 7 kg luggage mass according to ISO Standard 2416 - 1992), the fuel tank is filled to 90 % and the other liquid containing systems (except those for used water) to 100 % of the capacity specified by the manufacturer. (8) If the means of identification of type contains characters not relevant to describe the vehicle, component or separate technical unit types covered by this information document, such characters shall be represented in the documentation by the symbol “?” (e.g. ABC??123??). Vehicle type of category M1 / N1 / N2 with a maximum mass not exceeding 7,5 tonnes (1) is / is not (1) fitted with running boards or access steps. The design characteristics of the vehicle type shall permit entry to and exit from the passenger compartment in complete safety and entrances to the passenger compartment shall be constructed in such a way that they can be used easily and without any danger. The wheel hub, rims and other parts of the wheel shall not be deemed to be running boards or access steps for the purpose of this Regulation, except where reasons relating to construction or use preclude the fitting of running boards or access steps elsewhere on the vehicle. The height of the floor entrance is determined either directly from the ground surface or from the horizontal plane passing through the middle, in relation to the longitudinal direction, of the step immediately below. 1. ACCESS STEPS TO THE PASSENGER COMPARTMENT (Figure 1). The distance (A) from the ground surface to the upper surface of the lowest step, measured with the vehicle in running order on a horizontal and flat surface, shall not be more than 600 mm. However, for off-road vehicles (ORV) the distance (A) may be increased up to 700 mm. The distance (B) between the upper surfaces of the steps shall be not more than 400 mm. The vertical distance between two subsequent steps shall not vary by more than 50 mm. The last requirement shall not apply to the distance between the uppermost step and the floor entrance of the passenger compartment. However, for off-road vehicles (ORV) the allowed variation as indicated above may be increased up to 100 mm. longitudinal overlap (J) between two subsequent steps in the same flight, or between the uppermost step and the cab floor entrance height: 200 mm. However, for off-road vehicles (ORV) the value (F) may be reduced to 200 mm. In the case of off-road vehicles (ORV), the lowest step may be designed as a rung if this is necessary for reasons relating to construction or use. In such a case the rung depth (R) shall be at least 20 mm. Rungs with a round cross-section are not permitted. While getting down from the passenger compartment, the position of the uppermost step shall be easily found out. All access steps shall be constructed in such a way as to preclude the risk of slipping. In addition, access steps exposed to the weather and dirt during driving shall have adequate run-off or a draining surface. 2. ACCESS TO HANDHOLDS TO THE PASSENGER COMPARTMENT (as shown in Figure 1). One or more suitable handrail(s), handhold(s) or other equivalent holding device(s) shall be provided for the access to the passenger compartment. All handrails, handholds or equivalent holding devices shall be positioned in such a way that they can easily be grasped and do not obstruct access to the passenger compartment. A maximum discontinuity of 100 mm in the handhold area of the handrails, handholds or equivalent holding devices may be allowed. In the case of passenger compartment access with more than two steps, the handrails, handholds or equivalent holding devices shall be located in such a way that a person can support himself at the same time with two hands and one foot or with two feet and one hand. Except in the case of a stairway, the design and positioning of the handrails, handholds and equivalent holding devices shall be such that operators are encouraged to descend facing the passenger compartment. The steering wheel may be considered as a handhold. The height (N) of the lower edge of at least one handrail, handhold or equivalent holding device, measured from the ground surface with the vehicle in running order on a horizontal and flat surface, shall not exceed 1 850 mm. However, for off-road vehicles (ORV) the distance (N) may be increased up to 1 950 mm. If the floor entrance height of the passenger compartment measured from the ground surface is greater than ‘N’, this height shall be assumed as ‘N’. handrails, handholds or equivalent holding devices (V): 550 mm. clearance to vehicle components (L): 40 mm minimum with open door. Vehicles of categories M1 and N1 as well as N2 with a maximum mass not exceeding 7,5 tonnes, shall have one or more running board(s) or access step(s) if the floor entrance height of the passenger compartment is higher than 600 mm above the ground measured with the vehicle in running order on a horizontal and flat surface. However, for off-road vehicles (ORV), the distance specified above may be increased up to 700 mm. All running boards and access steps shall be constructed in such a way as to preclude the risk of slipping. In addition, running boards and access steps exposed to the weather and dirt during driving shall have adequate run-off or a draining surface. All vehicles shall be equipped with a device for reversing which can be operated from the driver’s position.